This third and final article on the Book of Esther will expound prophetic passages from the remaining six chapters with correlations to Christ and the coming Apocalypse. However, unlike the previous two articles, this article will not cover every verse to explain all messianic parallels; rather, much of what remains will be summarized so that the final article is not too lengthy for most readers to finish. The framework alone provides an opportunity for readers to go back and study the Book of Esther and discern some of the subtler parallels within it- things omitted from this exegesis. Indeed, it is more important that Bible-believers grow in correlating prophetic types and similitudes- as living parables orchestrated by God- than it is for me, the scribe of this website, to exhaust all that I find from the shadows provided within the book. From the passage above, the first thing that regular MOTS readers probably perceive is the repetitive theme of the “Bride of Christ” (i.e., covenant citizenry of New Jerusalem) appearing before the Lord on the third millennial day since the time of the cross (see Hos. 6:1-3), just as the Israelites under Moses were instructed to thoroughly wash themselves and their clothing in order to present themselves to the Lord GOD (Elohim YHVH) on the third day. Hence, the royal apparel that Queen Esther adorned herself with looks forward to white robes (i.e., wedding garments of righteousness) that believers will don to appear before the Messiah and “Throne of GOD” (see Rev. 6:11; 7:9, 13-17). Those who refuse to wear the righteousness of Christ will be cast out, as Christ explained in a parable about the Kingdom of Heaven (see Matt. 22:11-14). As for Esther appearing at the King’s house, the inner court looks prophetically to the Holy Temple of God that will soon be rebuilt in Jerusalem, and the house also speaks of when all believing Jews and the lost sheep are brought back into the House of Israel- i.e., to the appointed time when Messiah arrives to sit upon His throne for an everlasting dominion (Dan. 7:13-14). When Queen Esther touched the top of the King’s golden scepter, it was a notion of ruling harmoniously with him, at the height of his kingdom, for the scepter represented his dominion. Had an enemy or someone unworthy put their hand over his scepter, it would have certainly meant the death penalty, as an insult and challenge to the king. So the king’s response- that he would give her what she requested, even unto half of the kingdom- was an admission that he shared in her expression of authority. Likewise, the Scepter of Messiah (Gen. 49:10) will be happily shared with the saints who are called to reign with Him (cf. Matt. 19:28; 22:30; Rev. 1:6; 2:25-29; 5:10; 20:4-6). After Esther found grace in the king’s eyes, she requested that he and Haman- the haughty prime minister who sought to annihilate all Jews in the kingdom (the Persian Empire)- attend a banquet that she had prepared for them that very day. So now let us backtrack in parallels and consider this third-day feast as symbolic for the time from Adam rather than as the third millennium after the cross. Before the New Covenant was promised, Israel became a wife to God on the third millennium from the beginning of the age, under the covenant given by Moses (see Jer. 30:31-32). However, grace and salvation of the Jews (via the covenant of Yeshua) was not sought by people on that third day; rather, the Israelites collectively rebelled in the wilderness and under judges in the Promised Land, and they continuously hardened their hearts to their “Husband” in order to go their own ways, although they had feasted on the Word of God given through the holy Prophet Moses. No, Salvation (Yeshua) would be sought by the prophets and priests on the fourth millennial day, which is when all the books of the prophets (Navi’im) were written. Likewise, the queen Esther foreshadowed these things when she utilized the third-day feast to ask for another feast on the fourth day, wherein she would petition the King for the salvation of her people. As for Haman’s family, friends, and advisors, little information is provided. However, we know that his wife’s name, Zeresh, likely alludes to the religion that the Antichrist will be in covenant with during the apocalypse- a religion that hates Jews and Christians of the Holy Covenant, also called the religion of the “False Prophet” in Revelation. Although the Antichrist will be a secular humanist and blaspheme God while he insults all religion, he will pander to Islam and legitimize their plight against Jews for the Holy Land. Hence, Zeresh provides us insight because she was named after a Persian goddess from Liyan (southeast Iran today). An impulsive wife to haughty Haman, she was antipodal to King Ahasuerus’ virtuous and humble wife Queen Esther, as a false star goddess called the “Golden Goddess” and the “Great Goddess.” Remember, Esther means star, but Esther shines because she risked her life in asking for life, whereas Zeresh bears the shame of casually advising haughty Haman to kill Mordecai and all the Jews of the Empire. As for the gallows that Haman made 50 cubits high, it alludes to Holy Spirit coming at Pentecost/Shavuot to offer salvation to all who join the covenant of Messiah, and Pentecost means fiftieth day. The fifty cubits also look to the Great Jubilee of Christ’s coming. Jubilee Years come every fiftieth year, but the Great Jubilee comes with the 120th Jubilee Year since the beginning of the age with Adam. It is when the destruction in which Satan and his “Son of Perdition” have planned for faithful Jews and Christians is reversed. Instead, Satan will be chained and imprisoned for the Sabbath millennium in the “bottomless pit” (see Rev. 20:1-6), and the Beast and False Prophet will be burned in a lake of fire (see Rev. 19:11-21). Hence, the 50 cubits, just like the Ark of Noah that was built 50 cubits wide (see Gen. 6:15), alludes to the future salvation of the faithful elect and the destruction of the wicked who persecute them. Recall from the previous two articles that Mordecai had apparently been forgotten by King Ahasuerus, whereas his haughty enemy Haman was exalted as the king’s right-hand-man and royal vizier throughout the empire. Mordecai sat humbly at the entrance of the kingdom’s palace, watching princely men and exquisitely dressed women come and go, but no blessing of the kingdom or reward came to the faithful man of God. Worse, after saving the king’s life, Mordecai was accused of being lawless and a rebel, a troublemaker in the kingdom, and with that haughty Haman decided to slaughter all his people (Jews spread throughout the empire)- for his insult of refusing to bow whenever Haman passed by. For those who have a sense of compassion, with introspection of our own shortcomings, even compassion for the wicked who have harmed themselves in falling astray to the ways of Satan, the humiliation that haughty Haman endured, with the hand of God turned against him, is not something for us to celebrate. We should celebrate salvation, but all have fallen short of the glory of God, and all people have been fools at some point in their lives if they have lived long enough to allow it. Perhaps this may come across as sympathy for the devil, but the message is that we should all be careful when we think we stand, as Apostle Paul said, lest we also fall victim to the common traps that ensnare mankind (e.g., pride, vainglory, murderous thoughts, envy, and schemes to harm others). After all, it is our compassion for others, mercy, and love that separates us from the likes of Muslim zealots who slaughter all whom they consider religiously inferior, without grace and compassion. As we continue with haughty Haman’s humiliating fall from glory and power to disgrace, ruin, and death, we find a message that echoes as a warning through time for all despots set upon the destruction of God’s people: that God will deliver Jews, which is a message that extends to the Antichrist (a.k.a. the Son of Perdition). It is not because Jews are special in the flesh nor above that which is given for the rest of mankind, but deliverance comes for God’s own sake- for His works in fulfilling His prophecies and ushering in the Kingdom of Messiah on the Great Sabbath. Moreover, even curses in His Word, which Satan utilizes to bring destruction, are turned into blessing, and the Lord will “leave nothing undone of all that” He has spoken. Accusations of lawlessness bring the curse of death, but grace comes from the King’s throne for life. Even while Haman’s wise men were advising him of his downfall to Mordecai and the Jews, the king’s men were on their way to hasten him to the wine banquet of his destruction. This foreshadows Satan knowing that his time is short and the Antichrist being led to destruction in the midst of his plotting to annihilate Jews and destroy Israel. The great feast and banquet of wine is prepared for the salvation and joy of God’s people, but for their enemies it is a time of panic when the Messiah arises to tread the winepress of God’s wrath. What is this message that God has for the Jewish people and, indeed, all who might come to believe? The King of the Jews, as God manifest in Messiah, calls the wicked to their destruction by spiritually unfruitful servants (symbolism of the eunuchs who called to Haman), but the Bride of Christ- the elect citizenry of New Jerusalem- prepares their scriptural means and covenantal wine to petition the King for salvation through grace. If they do not drink the sacrificial wine in the presence of Christ, in remembrance of His the New Covenant and sacrificial blood, how can they be saved from their true enemy which is Satan? If they refuse and choose to hold their tongues, as Queen Esther was tempted to do, it will not lead to another captivity and slavery, such as when the Babylonians destroyed the Holy City and Temple of Elohim YHVH; it will be “utter destruction” as warned of in the Book of Malachi. This the panoramic message from God, and Moses and Elijah will soon appear as two witnesses to deliver it in Jerusalem. Remember, Esther was a type of New Jerusalem- the Bride of Christ. And the Antichrist will invade this resting place (the Sabbath place of God) before the Messiah returns to save the city and nation (House of Israel). Hence, the enemy Haman was revealed like the Son of Satan shall be during the Apocalypse, and his troops will ravish and destroy half of the city (see Zech. 14:1-8) before the Christ King destroys him with all nations that fight against Jews/Jerusalem. As we continue in correlations of King Ahasuerus to Christ, we find that the king issued a second written decree for the salvation of Jews. Hence, consider how marvelous and wondrous such a parallel as this is: God, the King of the Universe, first sent His written Word of the Old Covenant, and curses of death came to His people with accusations of lawlessness. Nonetheless, He was not finished; He promised Jews (and all of Israel and those who believe from all nations) a new covenant of healing and deliverance- not merely as a decree written in scrolls and books, as parchment and paper, but one written as from a loving “Husband” in depths of their hearts (see Isa. 53; Jer. 31:31-33). This love of the Great King is what the story of Esther alludes to. 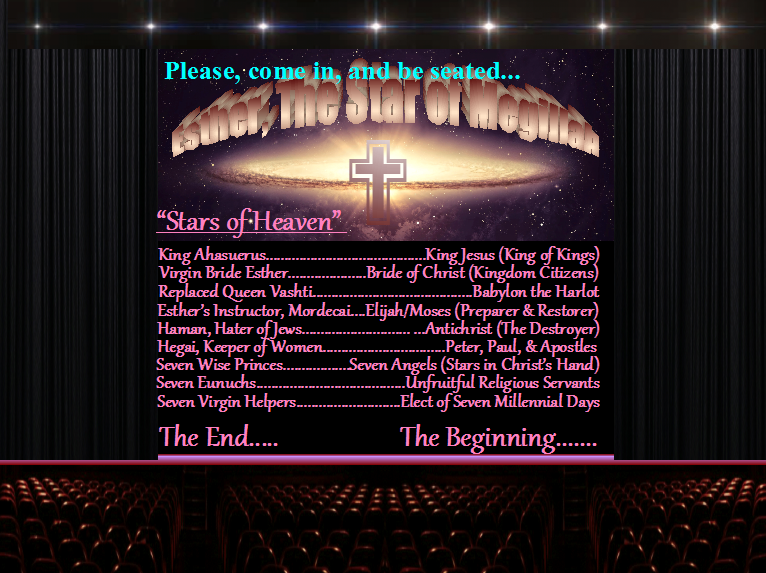 Everything is reversed for those who- as Queen Esther did- will simply humbly petition the King of Kings for salvation. Satan and those who hate the people of God are thereafter brought down from their mountains of pride, but meek and sincere valleys are exalted to glory and raised in triumph. What is there left to expound, although almost two chapters remain in the Book of Esther? From the first verse I have correlated the entire story to Christ and the God’s panoramic plan of redemption. Need I exhaust all parallels in hope that one unbeliever might be converted and believe that God lives and has ultimate control over all things? Should I continue to tell the same story over and over from different books of Scripture, which are but subtle variations that leave the spiritually blind undiscerning of these truths? I could do it, line-upon-line and precept-upon-precept, but that is not my objective- exhausting all parallels. Although I usually love doing the work- not for gain but for God, there comes a time when we must leave something leftover for those who are willing to learn for themselves the mysterious way in which God speaks. Okay, friend. Hope you keep me informed. Perhaps you could send me a letter if you don’t want to disclose too much. Are you on the run again Moshe?